Cecil Foster was 12 years old in 1966 when Barbados gained independence from Britain. Foster’s first novel in almost a dozen years delves into the formative period of the newly liberated nation, as seen through the eyes of 13-year-old Christopher Lucas. Like his childhood friend and neighbour Stephie, Christopher is a “grandmother chile,” raised under old-fashioned customs meant to instill self-discipline and good manners. Christopher and Stephie’s mothers live and work “over-’n’-away” in Canada, raising other people’s children and ignoring the ones left behind. Foster presents this evolving history in the context of a coming-of-age story that examines the challenges faced by both sexes. Christopher must reconcile all the changes taking place around and inside him without the help of a father or mother to ease his transition into manhood. Stephie, meanwhile, must accept that her future has been determined by her reproductive parts. 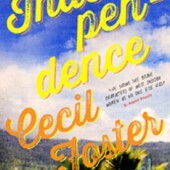 Independence is a richly detailed novel, offering a vivid portrait of a Bajan society in flux. The land, the flavourful food (and its strenuous preparation), the packed dance halls, and the sweltering heat all feel so present and real that readers may find themselves tasting the salt of an imagined sea breeze.